Hey, guys! You ready to rock getting organized today? Today we are going to work on a small task that will help keep you sane on a weekly basis. I love that! How about you? This one weekly task will help keep you on top of things in your house and be able to actually serve a healthy dinner on busy weeknights! That is worth its weight in gold…if you are like me. Today I'm going to show you my process for planning grocery shopping, shopping, and then actually prepping those dinners. It is a process I repeat each week. 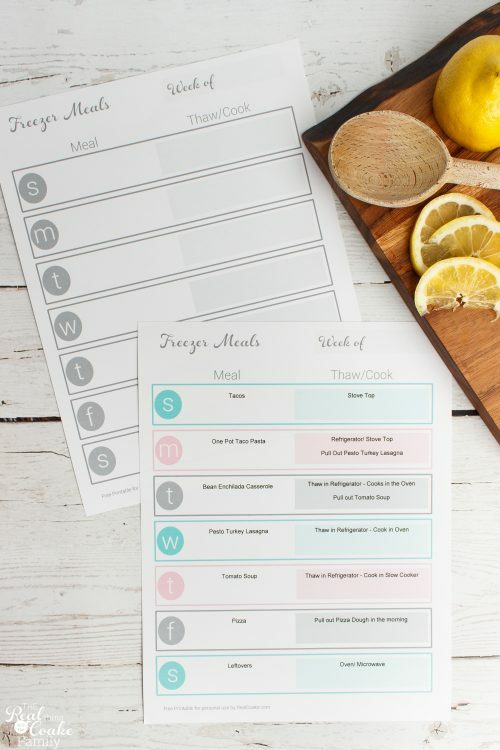 By using the meal planning I showed you last week along with making a list and taking care of some or all of the prep work, you will make it so much easier to get dinner on the table for the family. If you are like me, it will reduce the likelihood that you will just wimp out and eat out instead, it will increase your healthy food intake and help reduce your food budget (or keep it on track). 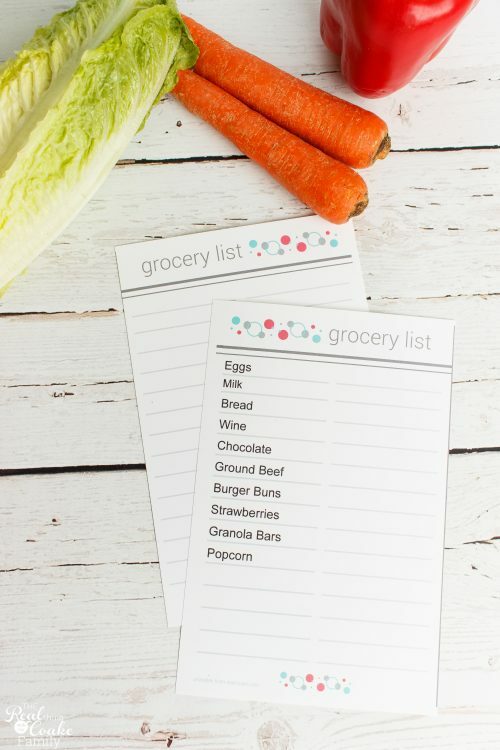 Making a grocery list will also save you time because you can shop once and be done for the week. No need to go to the store 6 times during the week. All great things in my book! I know this may seem obvious, but in order to get your grocery shopping organized, you need to start by planning your meals for the week. I'm not going to talk about that process here because I showed you the process for that in my post about meal planning. 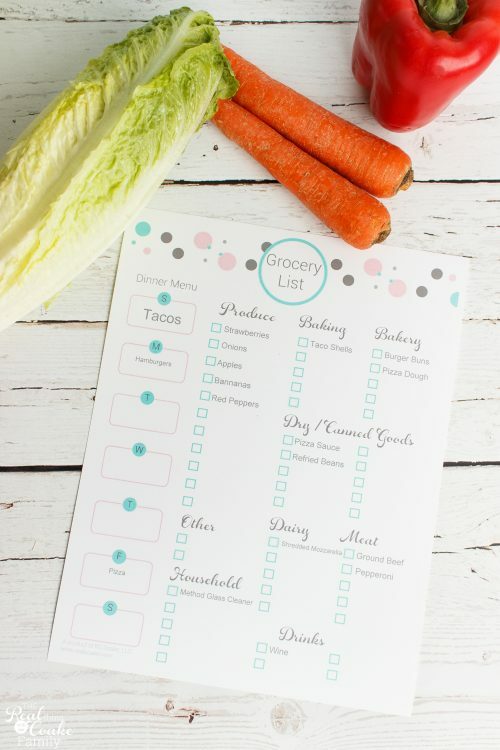 Assuming you have planned your meals, now it is time to make your grocery list. Start by looking at your meal plan for the week. Go meal by meal and check the ingredients you need with what you have in your pantry and refrigerator. Add anything you need to your list as you go. As you are checking ingredients, use this time to quickly throw away outdated items in your pantry and fridge. Take a minute or two to re-organize so that you have places to put the groceries you are going to purchase. This organized grocery list with the meal plan is so handy for this process. You can check your ingredients from your meal plan all on the same sheet on which you are creating your grocery list. The list can then go with you when you go shopping and the meal plan portion can be cut off and saved to reference through the week or simply used as a reference while you are shopping. 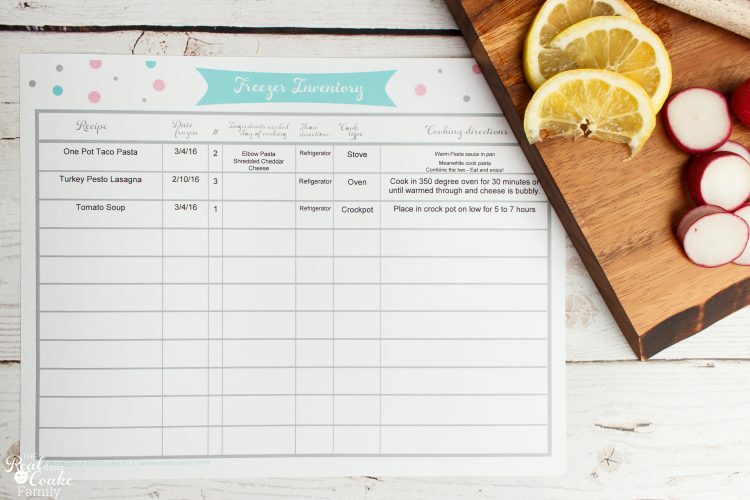 I've also got a free half sheet editable grocery list for you at the bottom of this post. Once you have gone over every meal you have planned for the week and checked which ingredients you need, you need to take a look at your staple pantry items. Everyone's staple items vary, but for me, I'm looking at butter, milk, cream cheese, eggs, bread, cheese, nuts, cereal, flour, olive oil, sugar, rice, chips, and crackers. After checking the staple items, take a look at the snacks for the kids and see what they need for the week. Finally, if there are any special occasions or things that you signed up to bring to an event for the week, make sure to add that to your list. I always double check my list because I really hate it when I'm missing things for the week. I don't want to take the time to run to the store during the week. Also, for me, I do the majority of my shopping at Trader Joe's which is about 20 minutes from my house. Running out of things means it is going to cost me more money to buy decent ingredients at a store closer to my home. Now that you have your awesome list made, it is time to shop. If you are using the organized grocery list everything will be by section of the store, it makes it really easy to grab what you need as you go through each section. It will save you time. Just follow your list as you go through the store. 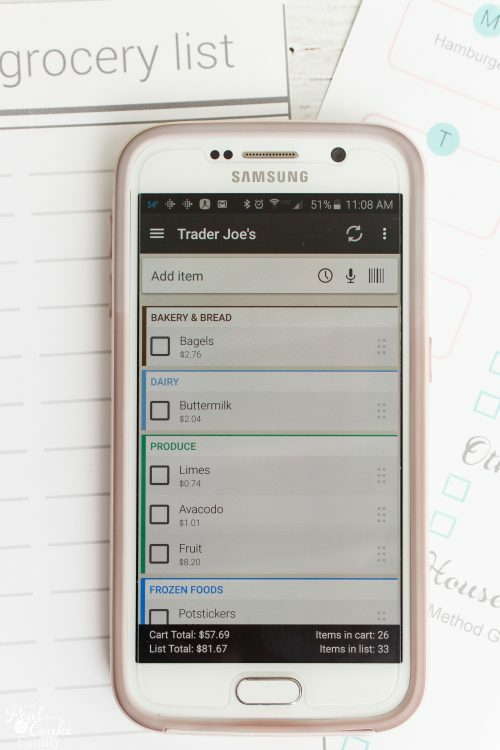 I actually prefer to use an app for making my grocery list. It makes it so easy when I'm shopping because it also organizes things by sections in the store and I just check the boxes as I add things to my cart. I also love that the apps that I've used allow me to add prices, so when I add something to my grocery list I know the cost and before I even head out the door to go shopping, I know about how much I'm going to spend. It makes it easy to stay on budget. I used Mighty Grocery for years and really love it. I think it can do some great things that Out of Milk can't, but my husband has an iPhone for work and I love Android, so we were having issues with Mighty Grocery because it is only available on Android. He could access it on the web, but not all of the features were there. A year ago, we found Out of Milk which does work on both platforms and has most of the features I wanted. For some reason you can't access both versions of Out of Milk from their site, so here is Android and here is iOS. Whether paper or app, make sure you cross things off as you add them to your cart. It will save you the heart ache of getting home to realize you forgot one or two items. When you get home from shopping, put all of the groceries away immediately. 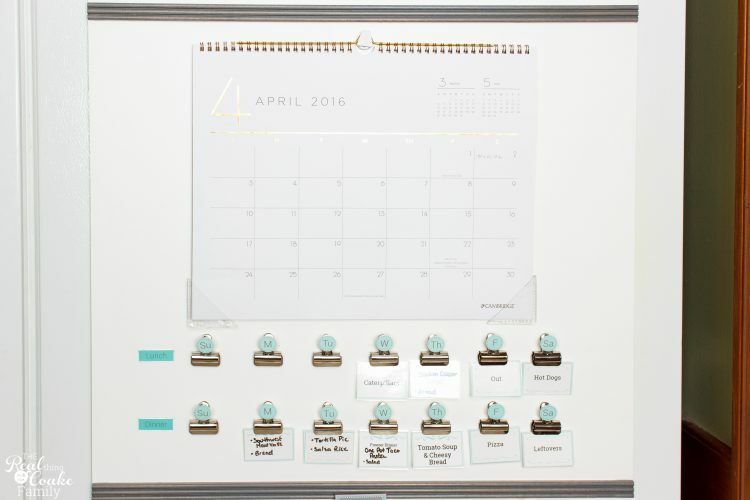 I know it may sound like a dumb thing to add, but remember you are working to feel more organized and on top of things at your home. Putting the groceries away right away will leave your kitchen feeling less cluttered and that makes your head feel less cluttered. Also, it is one less thing to do later. The final thing I wanted to touch on briefly is your actual prepping of the meals. For a while, I was using Once A Month Meals (affiliate link) and cooking 30 meals in one weekend (my review of cooking this way). I liked it a lot. It made weeknight meals so easy. It was hard to find a weekend to do all that cooking, but I liked the end result. Then our 2nd fridge died and I don't have enough room to fit all those meals in my freezer. I do love Once A Month Meals, so if you have the space I highly recommend it. One other tip about stocking your freezer with some dinners, it doesn't have to be an all day cook in which you make 30 dishes. I've started cooking some soups and other meals that I know we easily get two dinners out of. We eat one and I add the other to the freezer. I will probably be able to add 5 or 6 dinners that way, just by cooking things we can eat and freezing the rest. Genius meal prep tip! 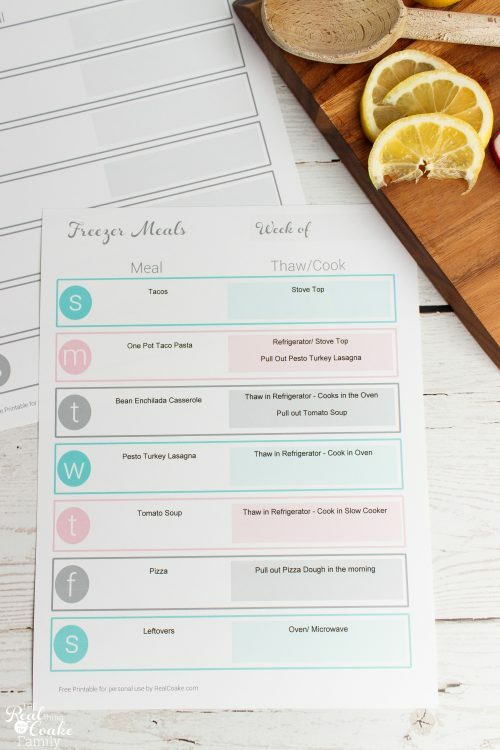 In the free printables I have for you, I've got a meal planning sheet for those of you using freezer cooking. It is editable and will help you remember what you need to do as far as cooking and thawing directions. If you do any cooking that you add to your freezer for future dinners, I've got an awesome spreadsheet for you! It will help you keep track of what you have, how many you have of each dish as well as the thawing and cooking directions along with any day of ingredients you will need. It will make it so easy to get that meal on the table! For those of us who don't have the space, there are still a few things you can do. If you prep school lunches or snack, you can take some time to do that when you get home from the grocery store. Or plan one time to knock that out and have it done for the week. You can also just do some prep work the night before. Since you have your calendar planned and your meals planned around your schedule for the week, you can prep the ingredients for a crockpot meal the night before. I always do this! I'm not a morning person, so adding chopping onions to a busy morning before I have to get out the door isn't going to work for me. You can chop up and prep most anything the night before. That is one of the things I learned from Once a Month Meals. Just chop the onions, potatoes, whatever is going in the crockpot for the following day and store them in a container in your fridge. It makes it so easy to get that dinner cooking the following day. You may never have put this much thought into grocery shopping and meal prep, but if you can add just a little bit of organization through a few of my ideas, I think you will really like the payoff. There are so many great ways to save time and money just by planning your meals along with planning your list, shopping, and meal prep. 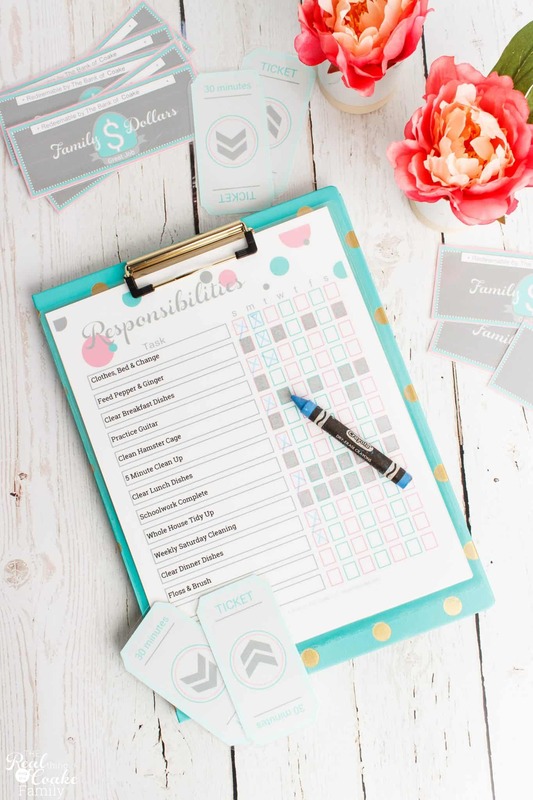 You can grab your free editable grocery list and freezer meal plan sheets by signing in below. Enjoy! What questions do you have for me about organized grocery shopping and meal prep? Just pop them in the comments below and I will happily answer them. You can also leave your tips and tricks below.. 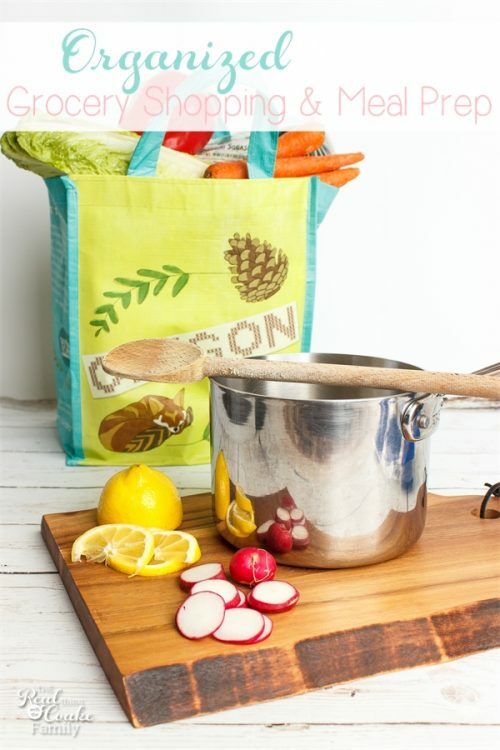 Such awesome tips for helping to make grocery shopping and meal planning easier!